A couple weeks ago I went and stayed in Boston for the 2 nights before Thanksgiving. Meg’s Uncle lives in Wakefield so we shacked up with brother Jim-Jim for Tuesday and Wednesday night. 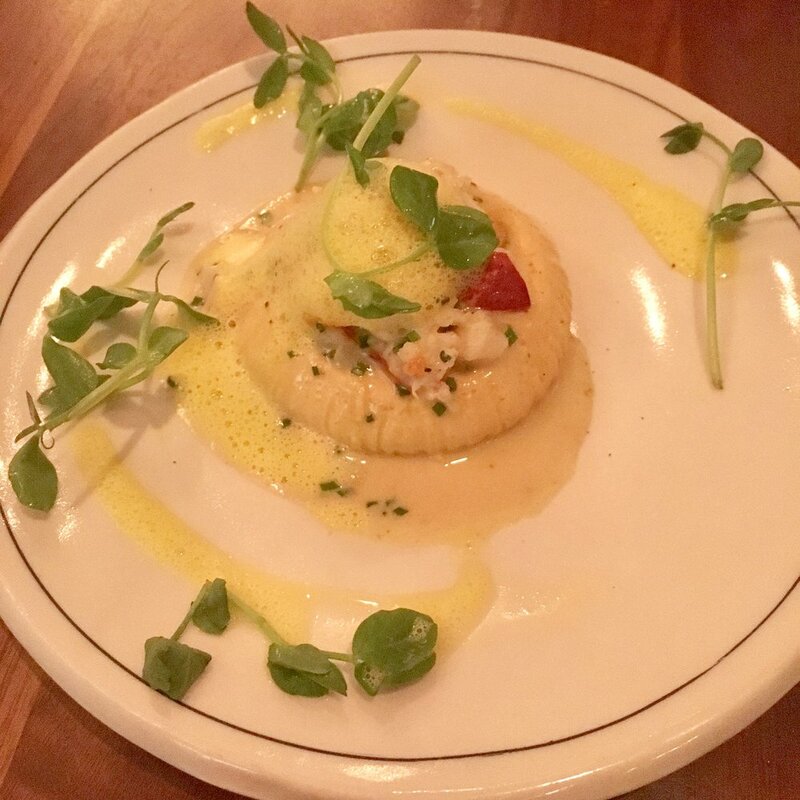 On Tuesday night Meg and I went and saw Squeeze at the Wilbur but before hand we were dazzled with an exceptional meal by one of my favorite Boston Chefs, David Bazirgan. David has opened restaurants all over the country and has cooked at the James Beard House multiple times. The last time he cooked there he brought me along and let me prep and cook alongside him and his crew, this was one of the high points of my adult life. I met David a few years back while visiting family in San Francisco, at a Madball show of all places. David asked a bunch of us to come eat at his restaurant Dirty Habit, a beautiful, swanky rooftop spot, half way between south of market and the financial district. 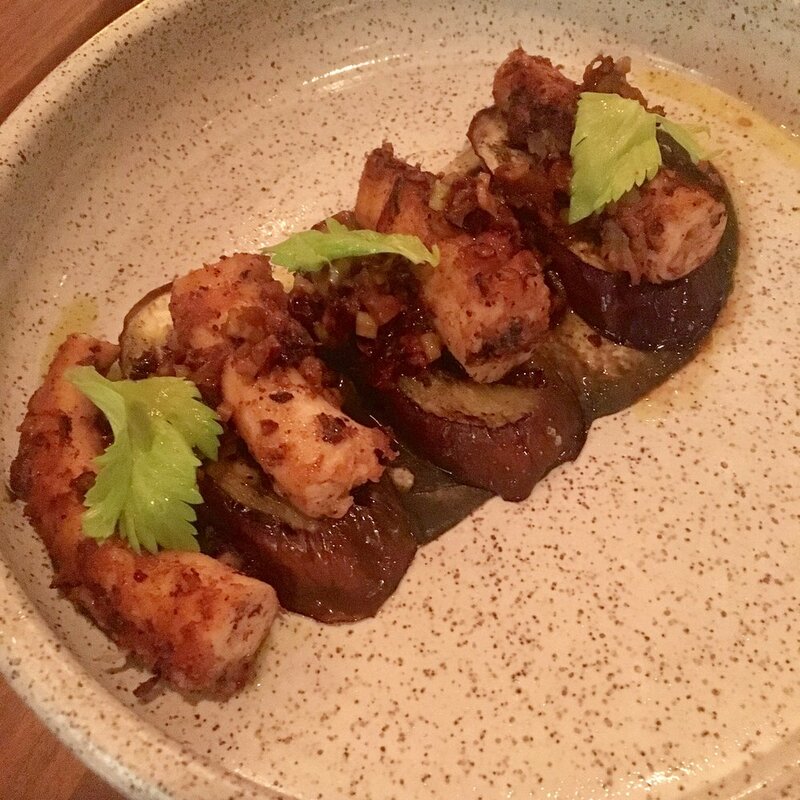 It was there that I fell in love with David’s cooking and his uncanny knack to cook, to this day, the best octopus I’ve ever had, earning him the title “Pulpo Master.” David is now the Executive Chef at Bambara in Cambridge. Bambara is the hotel restaurant inside the Marlowe, a BEAUTIFUL Kimpton hotel on Edwin H Land Blvd. For David’s menus, he pulls from his Armenian heritage and puts a little of that into every dish you can think of, so, shall we? First dish was the yellow fin tuna crudo with caponata, calabrian chili oil and what looked to be sliced fried sunchokes? Either way this was an excellent crudo. 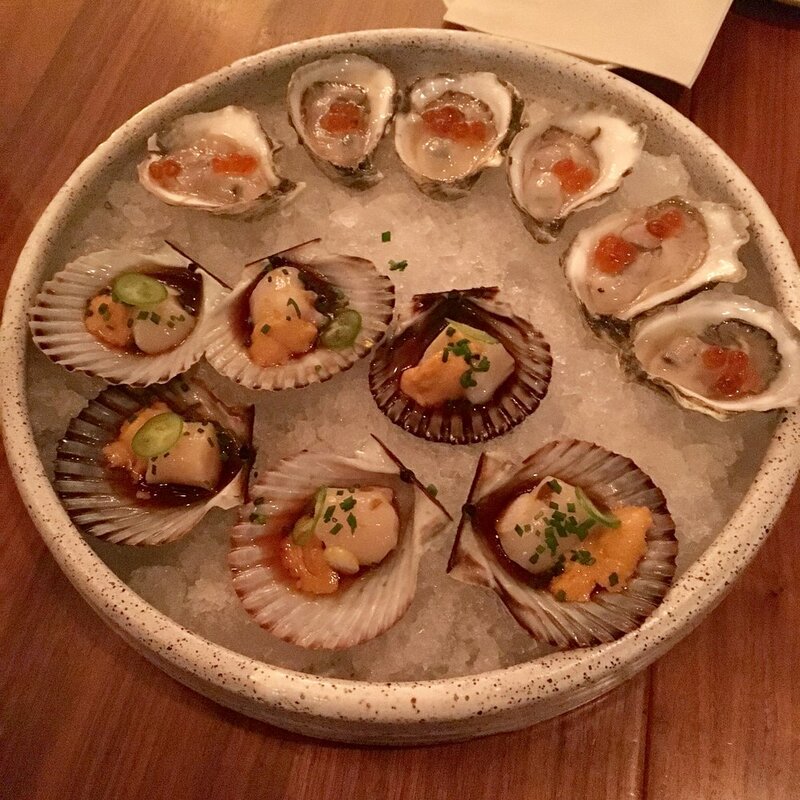 Next out was one of my favorite raw bar style shell fish dishes I’ve had in a long time, Oysters with roe and mignonette, but live Santa Barbara scallops with uni and a touch of soy sauce. I’ve never had a live scallop with such accoutrements, so damn tasty. Next was a nice little palate cleanser, roasted beets with cashew romesco, mandarin, feta and greens. Next was another small snack dish but heavy in flavor, roasted sunchokes, nduja vinaigrette with a buttermilk emulsion. The next dish was probably mine, and Jim’s favorite of the year, if not the most different. This dish was the sea urchin custard, aka the LOBSTER FLAN. Two of my favorite substances fused into one! Savory, yet I could totally eat it for breakfast, a damn excellent dish. Next up was the octopus I was talking about. Cooked perfectly on a small slab of eggplant with sour cherries and celery vinaigrette, this was a one that I took the liberty of eating more than one piece. Once the octopus was polished off, David brought out some baby brussels sprouts with apple-tahini and sunflower seeds. Next was a beautiful meat dish, I love merguez, this in particular was grilled with concord grapes, anise hyssop, yogurt and flatbread. I was ready to tap out, I don’t know why but I was nearing full, and with an insane twist, I did not want dessert, I know, insane. However David would not let us step out of the place without sampling both of the evenings pasta offerings. First was squash and ricotta pansoti with brown butter, hazelnuts and sage. Second was rye fusilli with smoked salmon belly, caper gremolata and radish. Both dishes were excellent, both totally different so I cant favor one above the other. We left the hotel satisfied to the brim after being fed by the best chef on the Cambridge side of the Charles River (in my opinion). 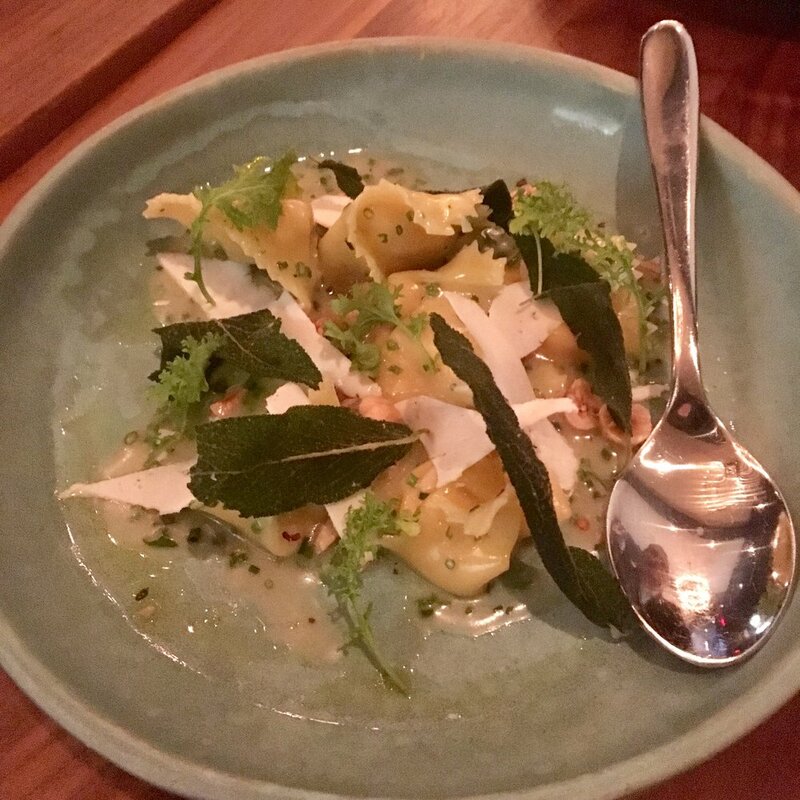 If you want to eat an eclectic and worldly meal, in the best city in New England, I suggest you pay David a visit.